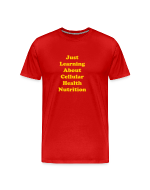 Our Cellular Nutrition Tee Shop is designed to Help promote cellular nutrition awareness to prolong longevity and wellness. Through this medium, it will create a level of assertiveness thereby educating people about the importance of good nutrition and dieting. You can Help Us Promote Cellular Health Nutrition & Diet Awareness For Optimum Health. You may want to tell others about good nutrition but do not have the necessary resources medium to spread the news far and wide, but your contribution will certainly add up even in a small way. You can contribute by wearing one of the "Cellular Nutrition" T-shirts. One philosopher and thinker once said that "Greatness is achieved by doing service to the many." Doing so will help to minimize these health hazards that plague thousands of people all over the world, and also contribute to the well-being, health and wellness of millions. This can be achieved by educating people on the importane of cellular nutrition what it can do, and how it can be done to improve their health and wellness, and also prolong their lives. Cellular nutrition tee shop provides a variety of T-Shirts at very reasonable price that helps to promote healthier lifestyles. 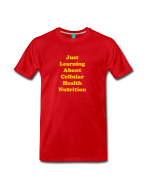 One The Finest and Most Unique Selection of Cellular Health Nutrition T-Shirts You Can Find on The Internet To Help Spread and raise Awareness. Again! Please pass the word along whether written, or verbally! The products in this online shop are created by Spreadshirt, the platform for Funny custom t-shirts, clothing and accessories. There are trillions of cells in the human body and they form the building blocks on which the whole body and organs are situated. These cells store the energy and oxygen the body and organs need to function effectively. It is on this basis why great emphasis is placed on the fact that the cells should be targeted with cellular nutrition to nurture and maintain them on a daily basis. In essence, the whole human body depends on these cells for nutrition that are carried by the blood throughout the system. When people are informed of the dangers and risk that can occur when the cells are not properly nurtured, they will realize that their lives are dependent on good cellular health nutrition that can certainly change thir lives. People will then make the effort and take action to implenent the process of good dieting and also change their lifestyles. We are committed to help bring about a level of assertiveness and awareness to the world in general through this medium as mentioned earlier, just to help others. Raw fruits and and vegetables in conjunstion with nutritional protein shake are one of the ways to start nurturing these trillion cells. However, it is imperarive to note that you will have to be consistent.